Attacking midfielder Adrian Mann, known as Aidy began his career at Northampton Town where he became the clubs youngest player during the 1983/1984 season at 16 years 297 days. He made over 100 appearance for the Cobblers before spells with Torquay United, Barnet and Newport County, before returning to local football with Northampton Spencer, where he ended hs professional dreams to combined van driving with football. He joined Diamonds at the start of their inaugural season in July 1992. He played in Diamonds first game, at home to Bilston Town on 22 August 1992, scoring his first goal for the club in their first ever FA Cup game when they hosted Desborough Town just one week later. 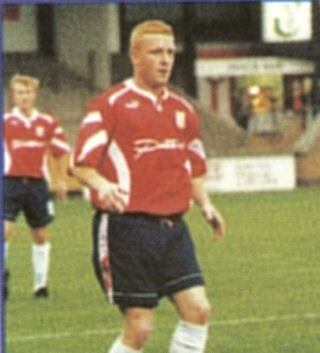 The popular midfielder was noted for his red hair, and played 130 games for the club in the three seasons at Nene Park, scoring a creditable 44 goals. 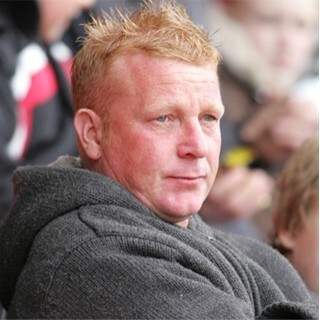 After leaving the Diamonds he joined Gresley Rovers in May 1995, before spells with Raunds Town, Higham Town, Kettering Town and Bedford Town. Aidy went into management, and his first appointment was with UCL Division One side Higham Town, where he became manager in February 1997. In his first season, he won the Championship, although promotion was not possible due to ground limitations. He left Higham in September 1999, and went one to spend two seasons in charge at Woodford United, and the 2002/2003 season at the helm of Cogenhoe United. On 21 July 2003, he became manager again at Higham Town, but in February 2004, left to become player manager at Long Buckby. He remained with the Bucks until January 2007, when he was dismissed, returning to Higham Town, and then Newport Pagnell Town as a player despite being in his forties. On 3 June 2009, he became assistant manager at Raunds Town, but following problems at Kiln Road, he left on 27 November 2009 to become manager of Rushden & Higham United, still making the odd substitute appearance at the age of 42. Shortage of players on 12 March 2013, saw him in the starting eleven at Harrowby Utd at the age of 45. He left the managerial post at Rushden & Higham in October 2014, but has continued to be involved behind the scenes at Hayden Road., and is currently the Rushden & Higham United chairman.